Long centuries ago when Ireland was largely covered in forest, people lived mainly beside and from the sea, rivers and lakes. The national highways of the time were on the waters along the coastline and larger inland rivers and lakes such as the Corrib. The coastline of Connemara has many examples of this past age with its myriad of ancient shoreline pathways, little harbours and landing places which can always be discovered at low tides since the sea has risen considerably over the centuries. Michael Gibbons, one of Ireland’s most well known archaeologists lives in Clifden, Connemara, and frequently leads walks and field trips giving people the opportunity to share in such discoveries of our past maritime history. There is also much evidence of early maritime travel between Ireland and the Mediterranean lands, not least of which were the much greater voyages of that intrepid traveller, St Brendan, who according to his Navigatio brought him and his companions to the New World in the 5th century. But many of our early harbour remains exist in the most inaccessible inlets and bays, and Michael would relate how these served not only the fishermen of the day but also a thriving smuggling trade of the 17 and 18 hundreds. (Silks, rum and many types of contraband). In 1812 the new town of Clifden was founded by John D’Arcy in Connemara and a more modern tidal harbour was built as the surrounding area was obviously developing and by 1837 it is recorded in Lewis’s Topographical Dictionary that some 800 tons of oats were being shipped out to London from this flourishing facility. The importance of our marine life and dependence upon the sea has generally had a history of very sad support from the State as evidenced by such as the shocking and sudden abandonment of the entire cargo fleet of Irish Shipping in the 1950’s, where ships were left to creditors in foreign ports and entire crews unpaid. Then again the sad loss of our well loved national sail training vessel, Asgard II, which sank off the French coast in 2010 and the State merely pocketed the €3.8 million insurance money, rather than raising her again, both to the shame of our country and bewilderment of other nations. 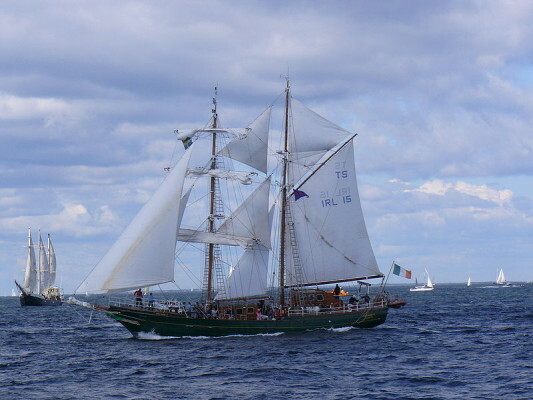 There was a similar training vessel to the Asgard for sale in Scotland for only £375,000 euro but again the State showed no interest and just abandoned the entire Coiste an Asgard youth sail training scheme which had trained so many thousands of young people. However it is more cheerful to hear that the privately owned tall ship ‘Johanna Lucretia’ ex Belfast did at least represent an Irish entry at the international Tall Ships event which took place at Waterford last July. Back in Clifden there are however new beginnings in the next stage of harbour development. Whilst the town harbour is tidal it is still a very important sheltered facility, and the Clifden Boat Club together with the Clifden Chamber of Commerce and Forum have embarked on the construction of deep water facilities in Clifden Bay itself which will be welcomed by many who sail our western coast. Galway port also has a long history of development over the decades and just recently new plans have been put on display showing a most ambitious and forward looking new development for the docks and facilities which will serve the city and the maritime industry well into this century. Earlier this year the Galway Archaeological and Historical Society hosted a brilliant and most comprehensive talk in the Harbour Hotel illustrating all the quays and harbours of Co Galway showing their myriad of locations and styles of construction, behind all of which lies a long history of local culture and development. This year also saw the website launch of http://www.corribcharts.com/ a voluntary setup and the person behind it has charted the entire Lough Corrib, producing a new and up to date chart as well as offering a download for those with a GPS of the complete navigation chart. It is also understood that the authorities are to renew all the navigation marks on the lake which will be another huge benefit to all its users. This ‘Blue Highway’, whether the waters be salty or fresh still remains one of the most important and strategic means for transport and travel. It needs no maintenance, upgrading or development, but it does demand a deep sense of respect. This page was added on 17/10/2011.